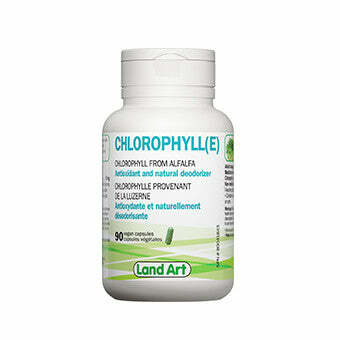 Land Art chlorophyll is extracted from alfalfa and dosed 100 mg per capsule has numerous properties that helps in the purification of the blood by oxygenating red blood cells and helping the system to release toxins. Alfalfa powder (medicago sativa) leaves and stems, leucine. *Contains no preserving agent, dairy, wheat, gluten, yeast or corn. Helps to alkalinize and deodorize the body. 1 capsule, 2 times a day. May cause discoloration of urine or feces. Consult a health care practitionner prior to use if you are pregnant, breastfeeding or expect to be pregnant.